Those visitors who do make the effort are invariably impressed by just how much this tiny country has to offer: world-class surfing on empty, dark-sand beaches; coffee plantations clinging to the sides of volcanoes; colorful Spanish colonial towns; and sublime national parks. There are few crowds outside the capital, San Salvador, which itself boasts more swagger than its Central American counterparts. Known as “El Pulgarcito of America,” or the little thumb of America, it’s a country full of rich culture, jaw-dropping natural beauty, delicious (cheap!) food and archaeology. Because of its small size, you can start your morning with a cup of coffee in the mountains and enjoy lunch overlooking the crashing waves on the coast. Joya de Cerén, sometimes called the Pompeii of the Americas, showcases the archaeological remains of a Mayan village buried by a local volcano more than 12 centuries ago. Tazumal, near the Guatemala border, is one of the country’s best surviving Mayan pyramids. 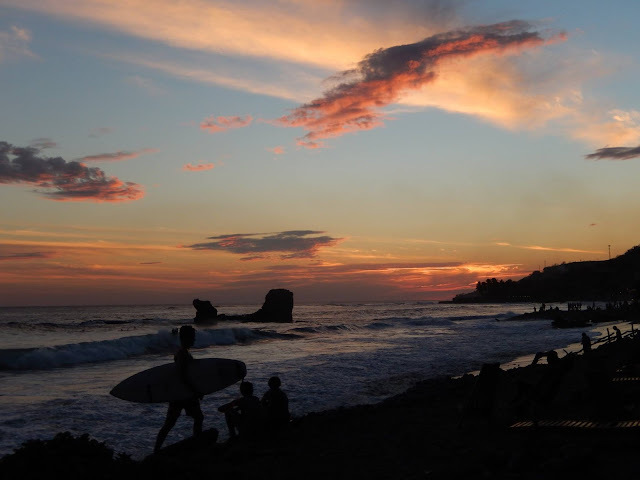 Along its Pacific coastline, El Salvador offers excellent surfing, especially at Punta Roca and El Sunzal. In San Salvador, don’t miss the stunning beauty of the modern El Rosario Church. And countrywide, enjoy plenty of delicious pupusas, El Salvador’s national dish—thick handmade corn tortillas stuffed with meat, cheese, beans, or all three. [T]he region’s tiniest nation proves an ideal destination for those who seek unspoiled natural beauty without the tourism clichés. Cozy and compact, with most sights just an hour or two from each other by bus, El Salvador is a place where you can inhale the aroma of coffee plantations and wander through archaeological ruins in the same day.